The Panasonic Toaster Oven NB-G110P FlashXpress with Double Infrared Heating lets you toast, bake, brown and reheat up to 40 percent faster than conventional toaster ovens. 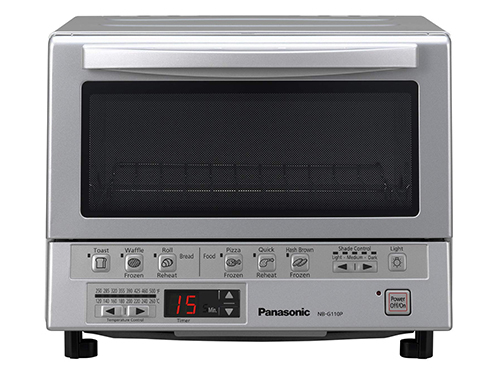 Featuring Panasonic FlashXpress technology, this 1300-Watt toaster oven instantly heats with the push of a button, eliminating the need for any preheating. Double Infrared technology produces temperatures of 250°F – 500°F, offering time-saving convenience by utilizing high-efficiency quartz and ceramic heating elements positioned near and far—in the front and back—to evenly toast, bake, brown and reheat to perfection. For added convenience, six auto cooking menus with illustrated preset buttons automatically calculate the cooking time for a variety of foods: bread (toast, waffles, bagels), frozen food (pizza, hash browns) and reheat (rolls, breads, leftovers). Simple up and down arrow touch buttons on the bright red digital timer quickly set precise cooking times up to 25 minutes; when done, a pleasant beep lets you know your food is done and ready to enjoy. This toaster oven includes a 9-inch square inner baking tray perfect for 9-inch diameter pizzas or 4 slices of bread, a removable crumb tray for easy cleaning and an interior light which allows you to view your food while cooking. Internal dimensions: 10-1/8-inch x 13-inch x 12-inch (H x W x D).